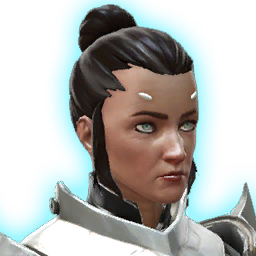 After joining the Outlander in the Scions' trials, Senya revealed that she is the former consort of Emperor Valkorion, and the mother of Arcann and Vaylin! In her youth, Senya's exceptional skills earned her a posting in Valkorion's elite guard. He was phasing out human military roles in favor of droids when she spoke out against the change. The fire in her words caught his interest, and she joined his detail permanently. Two years later, they began a secret love affair. Senya bore twin boys, Thexan and Arcann, and a daughter, Vaylin, but as time passed, she became increasingly concerned with the changes she saw in Valkorion and how he raised their children, particularly Vaylin. Senya attempted to flee with the children, but all three idealized their father and saw her as weak. She returned to the Knights to continue to serve Zakuul in her own way. When Arcann took the throne and massacred the Scions, she could no longer follow the Emperor, even if he was her son. Choosing a life of exile and rebellion, Senya is now on a mission to atone for her children's mistakes. Senya was pleased that you chose to take her along when dealing with the Heralds of Zildrog. Senya won't forget that you trusted Koth over her when dealing with the Heralds of Zildrog. Senya was disappointed in your decision to destroy the Spire. Senya's respect for you grew when you decided against destroying the Spire. Senya was grateful you trusted her judgment and allowed her to escape into hyperspace with Arcann. Despite your attempts to shoot them down, Senya escaped into hyperspace with Arcann and disappeared. Senya tried to heal Arcann on Voss, but you tracked her down and killed her. Senya tried to heal Arcann on Voss. When you decided to help her, she sacrificed her life essence to heal her son and now lies comatose in the Alliance base on Odessen. Senya recovered from her coma and has rejoined the Alliance--and her healed son, Arcann--to join the fight against the Eternal Empire.